German death metal crushers Obscura just released their latest album Diluvium. Frontman Steffen Kummerer fills us in on the record, tour plans, the importance of music vides, the possibility of a live album, his other band Thulcandra and other topics. Chad Bowar: It’s Rafael’s first album with the band, but since he has been with the group for a few years now, did that make the songwriting and recording process for Diluvium a bit smoother? Steffen Kummerer: It was helpful that Rafael performed for roughly two years with the band before we started to compose new material within the group. Still, the most demanding task writing and producing Diluvium was the process to integrate both Rafael Trujillo and Sebastian Lanser (drums) into the mindset and framework of the band Obscura. Both share their very own musical background, preferences and tastes in their respective writing. You worked with producer V. Santura again on this album. What is it about his style that works so well with Obscura? V. Santura follows the band as a close friend, engineer and producer since 2003 and was involved in all recordings of the band. Working with a producer for such a long time built up ties for the long term and together we evolved into what we call the process of recording each record. We all share the same vision and grow in our fields quite equally. Even thinking about the possible idea working with another producer, there is no one in the business I am aware of to be able to deal with this kind of music the way V. Santura does. Finishing my rhythm guitars one day earlier than expected. The whole production took around three months, starting on October 1st until the end of December. While the studio sessions are timed and need a certain discipline to fulfill each deadline for each instrument, we rarely finished one step earlier than expected. The production was the smoothest recording of all records so far. This is the first album since Retribution to have no songs over 7 minutes. Did you focus on writing shorter songs, or is that just how they happened to turn out? We do not plan a song in terms of how long it shall turn out in the end. Writing songs for me is an equivalent to telling a story to someone. Some speak for hours while you fall asleep and the value or content tends to be almost nothing. In the case of Diluvium, we just felt satisfied when a song was finished, and each arrangement contained a fluent dramaturgy from front to end. We work with the freedom of having no boundaries and keep the music and artistic side along our vision. Shorter or longer songs haven’t been a topic we discuss in the band so far. Diluvium marks the final chapter of a four-album concept work that started back in 2009 with Cosmogenesis. The overall lyrical concept deals with the ultimate end of all ends and leads the listener to a rebirth of the first record. While the songs relate to previous albums, the lyrics finish storylines that had their origin on the other records, finishing each idea. While Cosmogenesis represents the origin, Omnivium a certain evolution, Akroasis to develop your own consciousness, Diluvium represents the apocalyptic theme in a perpetual life-cycle. You did a video for the title track. How important are videos these days? Personally, I am still part of the scene, reading printed magazines as well as online media and listening to new bands as well as old heroes alike. Reviews represent a certain opinion of the writer and tend to be everything but objective. Reflecting on an overall feedback, reviews have their importance and I do read many of them. The bottom line seems important, if there is one negative or one overwhelming review it won’t represent the overall album. The album is being pressed in several vinyl editions. Are you a vinyl collector? Diluvium was released in seven different editions since all previous releases have been sold out within a short amount of time. I rather collect CDs since I grew up with this format and keep my collection sorted. Vinyl I buy from bands I admire and want to support. When the whole back catalog of the Swedish Dawn was re-released a while ago I had to purchase simply all editions of all records. As you look back on the recently wrapped tour cycle for Akroasis, what were some of the highlights for you? Being part of Death to All’s “Individual Thought Patters” European tour was one of my personal highlights of the whole touring cycle. Being direct support of Sepultura in 2018 and a following Japanese tour with killer turnouts and feedback was special for sure. Sepultura treated us and all supports very nicely and I am grateful to see how a huge band stands with both feet on the ground, simply being respectful to everyone. You’ve never released a live album or standalone DVD. Any plans of doing one, perhaps of the 15th anniversary show? We indeed recorded our 15-year anniversary show with high end audio and video systems. We won’t release the material as a physical DVD or Blu-ray, but rather publish the material online for all of our fans that didn’t made it to the concert. In general, I would love to release a proper live album or a DVD, but the production and performance has to be top notch as well as a visually great looking venue. We are already working on a row of ideas for the near future – watch out. There are a couple of festivals on your calendar. Any other tour plans coming up? We just announced our return to North America with shows in the United States as well as Canada in September and October 2018. Supporting us are Beyond Creation, Archspire, Inferi and Exist – all handpicked bands by us to build up an interesting evening and a must for everyone interested in death metal at all. More tours in Europe, Japan, Australia and Central and South America are going to be released in the coming weeks. The positive feedback for Diluvium also has an effect on our touring schedule. We get more offers that we can accept. The promotion process for albums these days is very lengthy and public, mainly due to social media. Do you miss the old days when there was more mystique around bands and albums? Yes, but times change. Personally, I dislike the fact that each musician documents each step in the studio and on tour with his Facebook or Instagram account just to fish for attention and present himself. The distance between an artist and his work versus our fans seems smaller than years ago. I see the necessity to go ahead and follow a changing game, but I miss a certain respect towards the artists at certain times. What’s the status of the next Thulcandra album? Thulcandra will enter the studio by the end of this year to record a follow up to Ascension Lost. We have been more active than ever, including touring activities for the band and supported Secrets of the Moon and Dodheimsgard on their European Tour that was followed by our headlining run in 2017 alongside Nailed to Obscurity. The fact that each release of Obscura turns out bigger than the previous one keeps my full attention at times. 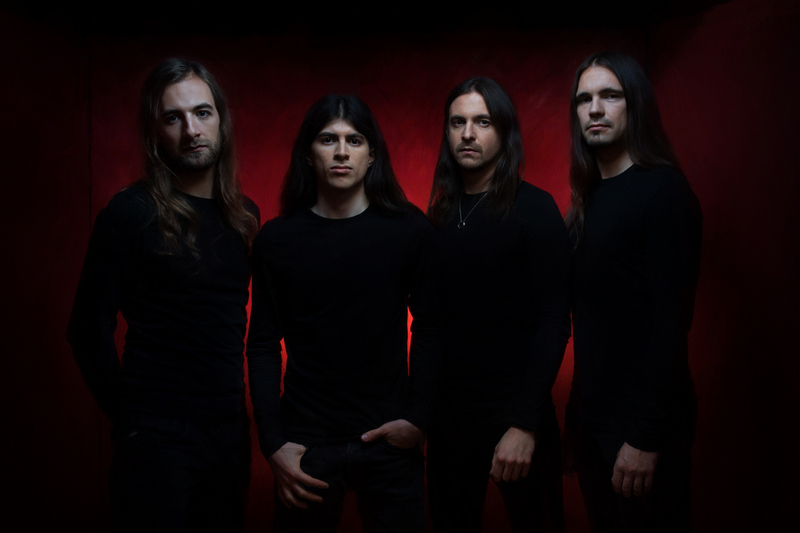 Both Obscura and Thulcandra are bands I admire the same way and enjoy writing music for and playing the material live. The only difference is the fact of being an international touring band with a full schedule with Obscura. What are some of your non-musical hobbies and interests? Design in various forms as well as being a huge supporter of soccer fulfill my interests pretty much. Mastodon – Once More Around the Sun, Allegaeon – Proponent for Sentinence, Lik – Carnage, Megadeth – Dystopia, Darkthrone – Arctic Thunder .